Although Hurricane Irma made landfall in the Lower Florida Keys as a Category 4 hurricane, the massive storm generated wild coastal flooding patterns throughout the Florida peninsula, Georgia and South Carolina. 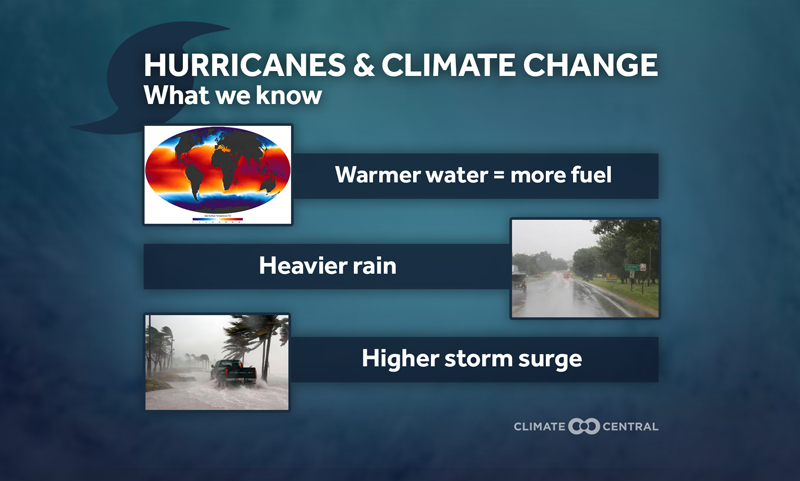 Here's a recap of Irma's storm surge impacts. 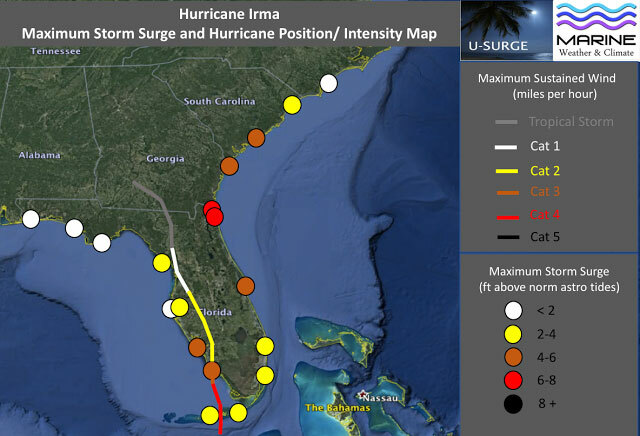 The map below depicts Irma's peak storm surge levels, with storm surge representing the difference in observed and predicted water levels based on normal astronomical tides. The highest observed storm surge levels exceeded 6 feet in places near the Florida-Georgia border, like Fernandina Beach and Mayport, while water levels in a wider area from east-central Florida through South Carolina, as well as portions of southwest Florida, observed surge levels exceeding 4 feet. Map of maximum storm surge data. As people are just returning to the worst-hit areas of the Florida Keys and southwest Florida, maximum storm surge areas are still being reported. The table below provides the mapped data in tabular form. Irma's large size and shore-parallel track through southwest Florida enabled the storm to generate four distinct storm surge events in different regions. Here's a summary below. Irma made landfall at Cudjoe Key in the Lower Florida Keys, as a Category 4 hurricane with maximum sustained winds of 130 mph on Sunday at approximately 9:10 a.m. local time. NOAA tide gauges to the west (Key West) and east (Vaca Key) of Irma remained more or less operational throughout the storm's passage, although the gauge at Key West has been reporting data intermittently. Surge levels at both sites increased substantially after Irma's eye passed and winds changed direction. As Irma approached, prolonged winds were blowing from east to west across the Keys, but winds suddenly reversed from west to east after the eye passage. Maximum surge levels at both Key West and Vaca Key remained less than 4 feet. Storm surge levels are highly localized, particularly in island chains, where two locations just several miles apart border water in different directions. For example, the NOAA tide gauge at Key West is located near the western end of the island, making it most susceptible to storm surge generated by a strong west wind. Based on Irma's track, the highest storm surge levels in the Keys, would have likely occurred near Cudjoe Key, Big Pine Key and Marathon. Initial rumors of a 15-foot storm tide (storm surge plus tide) circulating social media remain unverified and were likely exaggerated. However, numerous images of sail boats swept onto the Highway 1 provide evidence of a powerful storm surge that swept through the islands. While spending time on Monday evening on social media groups focused on connecting locals from the Florida Keys, I noticed that numerous posts suggested a peak storm surge in the range of 5-6 feet at Cudjoe Key. However, this information was still speculative, as evacuees were not allowed back into the region yet and information from the Keys to the outside world was limited, often relying on satellite phones. We will know more soon. Florida's west coast observed the most unusual storm surge patterns as Irma moved from south to north approximately following a shore-parallel track. Due to counterclockwise winds around hurricanes in the Northern Hemisphere, substantial "negative" storm surges, when water is pushed away from the coast, occur when hurricanes take shore-parallel tracks and have a large body of water to the left of their forward path. This occurs because prolonged winds of increasing intensity blow offshore along the coast, while the storm cannot draw any new water to replace the displaced water because strong winds are blowing offshore. Numerous images of extensive mudflats emerged on Sunday afternoon in places like Tampa Bay. In some cases, humans were able to rescue marine animals like dolphins and manatee that were stranded by the receding water. People should use caution in such situations because rapid changes in wind direction as the eye approaches can lead to the water rushing back into the bay, along with additional water from an onshore storm surge. The hydrograph below shows a "negative" storm surge of approximately 5.3 feet was observed at Old Port Tampa on Sunday afternoon, followed by rapid water level rises leading to a storm surge that exceeded 3 feet by Monday. Loss of data near the peak "negative" storm surge may indicate that the water level was too low for the gauge to record. Hydrograph for Old Port Tampa depicts a substantial "negative" storm surge followed by a "positive" storm surge. The red line is the observed water level, blue is the normal astronomical tide, and the difference is the storm surge. Negative storm surges of this magnitude are somewhat rare but not unprecedented. The U-Surge Project, which provides more than 9,000 storm surge observations for the U.S. since 1880, places Irma's negative storm surge at Old Port Tampa as one of the five largest negative storm surges ever recorded in the U.S. Three of the top five events occurred at Tampa. The Great Miami Hurricane of 1926 generated the most extreme negative storm surge level on record, as the storm took a shore-parallel track along the northern Gulf Coast, which generated powerful offshore winds near Mobile, Ala., reducing water levels in Mobile Bay by more than 10 feet. This storm did not take a shore-parallel track along Florida's west coast, but Tampa stayed north of the storm's track, enabling powerful offshore winds to persist through the most intense part of the storm. 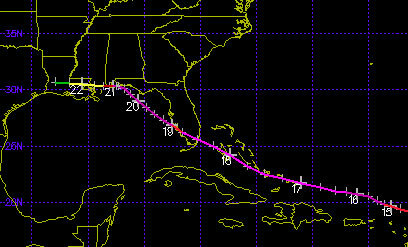 The Great Miami Hurricane of 1926, generated a "negative" storm surge of 10.3 feet at Mobile, Ala., and 6 feet at Tampa. Powerful offshore winds pushed water away from the coast in both cases. Although negative storm surges may seem benign, and appear harmless compared to positive storm surges, such events can have negative impacts as well. Rapid water loss in marinas can leave fiberglass boats on hard surfaces as powerful winds push them around. Of greater impact to the general public would be loss of water for critical cooling processes at large facilities like power plants. Given the susceptibility of negative storm surges at Tampa, local planners and utility operators should review potential impacts from negative surges in the region. Storm surge levels in southwest Florida, near Naples and Fort Myers, are not as severe as forecast, as Irma tracked farther inland than feared on Sunday morning. 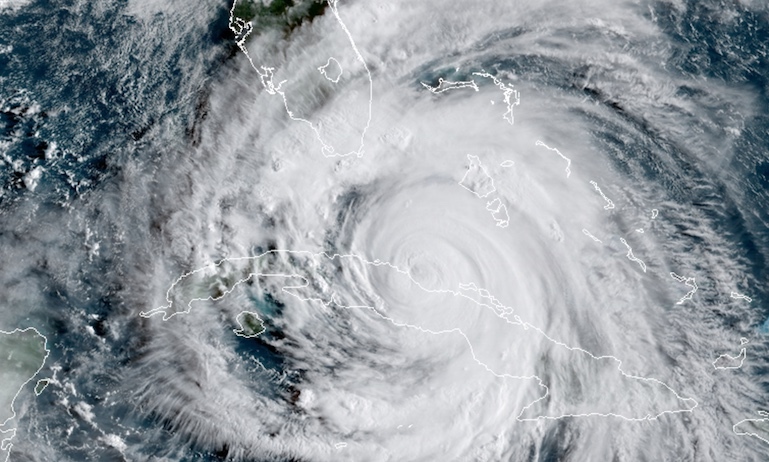 Nonetheless, the eye remained offshore while passing the community of Everglades City, and reports are just surfacing about extensive storm surge flooding in this region. 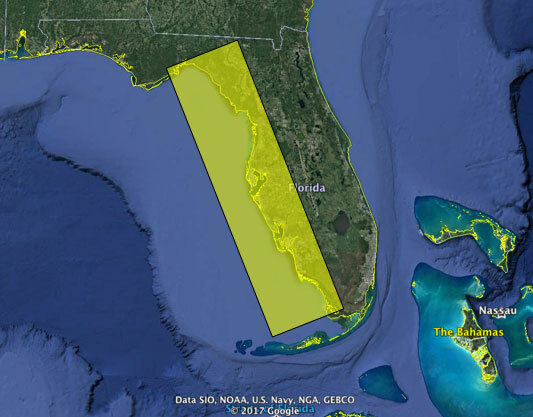 Everglades City likely observed the highest storm surge level on Florida's west coast. Southeast Florida remained on Irma's "strong side" from Friday through much of Sunday, enabling storm surge to gradually increase over a several day period. At Virginia Key, near Miami, storm surge levels unfortunately peaked around midday Sunday, near the time of high tide. This enabled the NOAA tide gauge at this site to report a maximum storm tide level of 3.88 feet above NAVD88 datum. 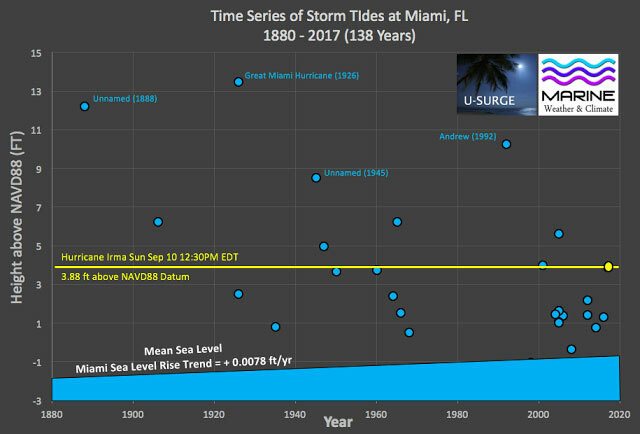 The U-Surge Project launched a Miami website as Irma approached, enabling us to compare Irma's maximum water level with 27 observed events since 1880. 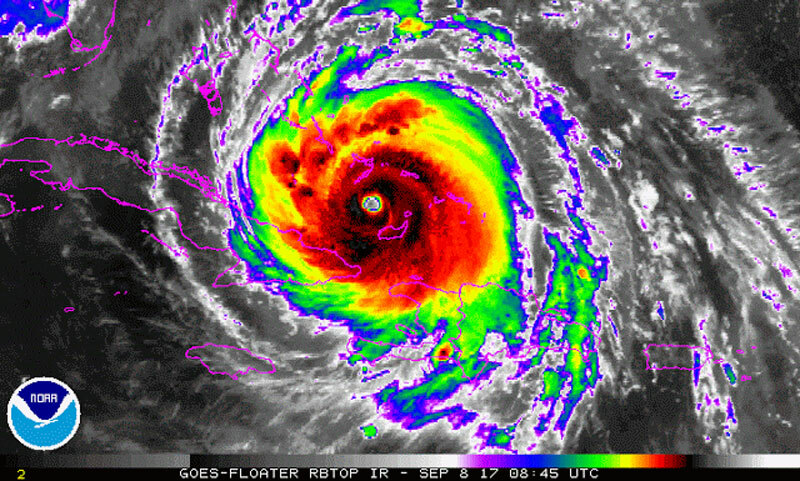 Irma's storm tide ranked tenth all-time and was the highest reported saltwater level since Hurricane Wilma in 2005. This water level was high enough to flood much of Miami's financial district on Sunday. 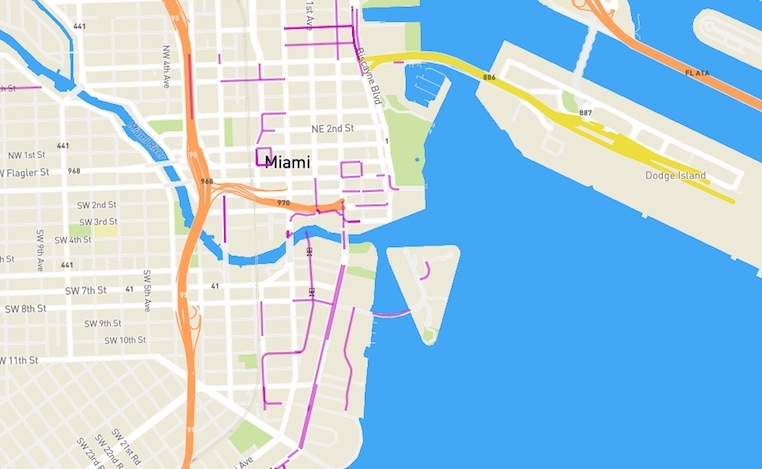 Approximately 10-12 inches of sea-level rise in the Miami area over the past century enabled Irma to flood thousands of additional properties, even though the peak storm surge remained around 4 feet. Time series of observed storm tide events at Miami, Florida, from 1880-2017 (138 years). Irma's storm tide ranked tenth all-time and highest since Hurricane Wilma in 2005. The highest credible storm surge observations have been reported from northeast Florida through South Carolina, including the Georgia coast. Fernandina Beach, Fla., near the Georgia border, leads the pack with a 7.48-foot storm surge observation. 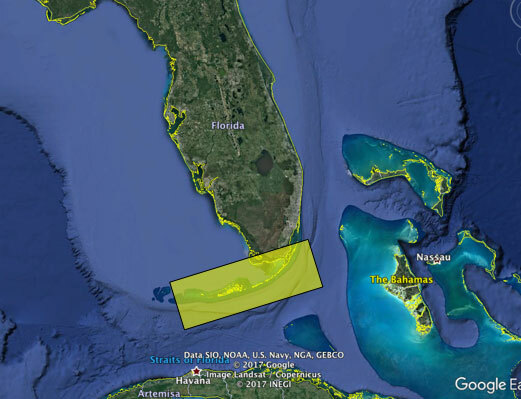 Due to high tidal ranges in this region, storm surge observations only tell part of the story. The worst flood impacts usually occur near the time of high tide. As this region stayed on Irma's "strong" side throughout the entire event, a prolonged storm surge in this region ensured moderate storm surge levels would persist through multiple high-tide cycles. Although storm surge levels at Fort Pulaski, Ga., near Savannah, peaked at more than 5 feet near the time of low tide before dawn on Monday, persistent onshore winds kept storm surge levels elevated through the day. Astronomical tide levels rose faster than storm surge retreated on Monday morning, enabling peak water levels to exceed 12 feet above mean lower low water, which generated the second-highest water level on record at the gauge in an 82-year period, barely missing the maximum level set last October by Hurricane Matthew, according to Jill Gambill with Georgia Sea Grant. On their Cat-6 blog post yesterday evening, Jeff Masters and Bob Henson provided excellent insights on storm surge observations in Georgia and northeast Florida, including a record water-level set in Jacksonville. Irma's persistent storm surge, heavy rainfall runoff and high astronomical tides converged in this region to provide widespread flooding on Monday. Both Jacksonville and Savannah were victims of compound flooding, when prolonged onshore winds elevate storm surge levels for multiple high tide cycles and impede the drainage of heavy inland rainfalls. Let's hope the Gulf Coast and Southeast States can dry out in the next couple of weeks and that Hurricane Jose stays out to sea!